"I still want to win races. For me, that is the most important thing. When I see other athletes on camps I still feel that I'm a whole lot more motivated than they are, even the young kids, which makes my life easier I guess! 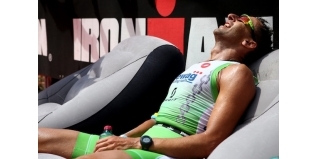 I still think about triathlon the same as when I entered the sport, I'm still hungry." As a Pro race for men only (Ironman 70.3 Augusta on the same day was a women-only race for Pro's), the $50,000 purse means a winning cheque of $20,000 for one of the most consistent Ironman and successful Ironman athletes in history.